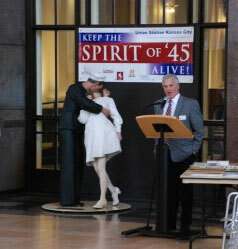 Press conferences featuring two life sized sculptures depicting the famous “Times Square Kiss” were held at historic Union Station in Kansas City, MO and the USS Missouri in Pearl Harbor, HI to officially announce the beginning of the 2012 National Spirit of ’45 Day national public awareness campaign. Union Station Kansas City has a unique WWII heritage. It has been estimated that half of all the US soldiers who served in World War II passed through the Station during the war. The Station saw a record 678,363 travelers in 1945. Union Station Kansas City President and CEO George Guastello opened the ceremony by describing the feeling in the Station on August 14, 1945, a day when the crowd of celebrating soldiers and civilians was so big that you couldn’t see a speck of the marble flooring, according to the station master. “Smiles replaced tears, as the Station took on a new meaning from the war… it meant ‘home’,” wrote Jeffrey Spivak of the Kansas City Star. 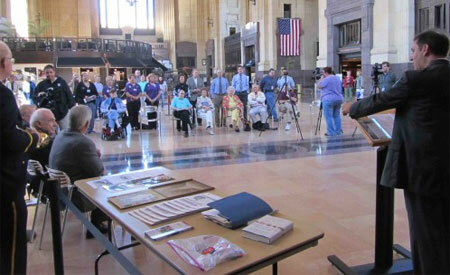 Press conference in Union Station Kansas City on September 21, 2011. Union Station CEO & President George Guastello opens press conference prior to unveiling of the "Times Square Kiss" statue on September 21. The Seward Johnson sculpture will be on display in the Grand Hall of Union Station through November 5 when it will travel to Branson, MO to be part of its Veterans Day activities. Other speakers included representatives from the Harry S. Truman Presidential Library, VFW National Headquarters, and Vitas Innovative Hospice, and members of the “greatest generation.” including Bill Swicegood who said he was in Times Square on August 14, 1945. Union Station fell into a state of disrepair until voters in four counties (three in Missouri and one in Kansas) approved a first-of-its-kind-in-the-nation bistate tax to raise $118 million, which together with an additional $140 in private donations and federal funds, to restore the Station to its former glory. The Station now self supporting and considered Kansas City’s signature historical landmark and civic asset. WWII Navy vet Bob Davies accompanied by members of Vitas Innovative Hospice. 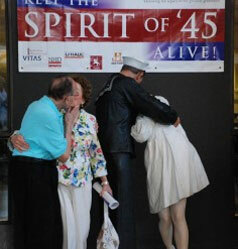 Vitas is a national sponsor of Spirit of '45 Day, and helped support hundreds of events each year across the country. Jerry Newberry, head of communications for VFW National Headquarters, spoke on behalf of returning veterans of all eras during the press conference. WWII Army veteran Carmelo Gusstello and his Rose, his wife of 68 years, keep the Spirit of '45 alive with a "Kansas City Kiss" after the unveiling. 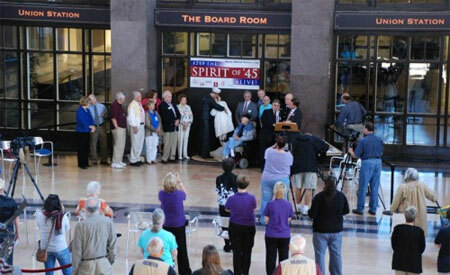 Hegg was on hand for the unveiling and to announce plans for the National Spirit of ’45 Day 2012 public awareness campaign. A second life size replica of famous 25 ft tall Seward Johnson sculpture now stands in front of the USS Missouri in Pearl Harbor, HI. A twenty-five foot version of the "kiss seen round the world" attracted international attention when it was placed in New York City's Times Square for the first National Spirit of '45 Day observance in August 2010. Click here to see the Kansas City Star’s coverage of the unveiling. 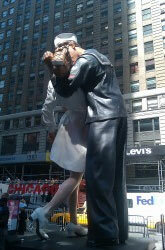 The 6 ft. sculptures are replicas of the 25 ft sculpture by famed artist Seward Johnson that was inspired by the iconic photograph of a sailor kissing a nurse on August 14, 1945, the day President Harry Truman announced that WWII had ended. One of the larger versions stands in front of the USS Midway in San Diego, CA and another has been donated by a Navy WWII veteran to the City of Sarasota, FL. The sculptures are being loaned to the Spirit of ’45 Day national initiative by the Sculpture Foundation which moved one of the larger versions of the “Kiss” in Times Square for the inaugural kick off ceremony held on August 14, 2010.